Leonard is an accounting and financial services graduate. 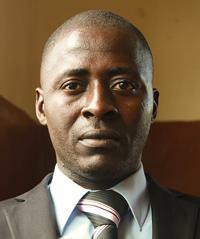 He works as Finance Director and Schools Manager for the Lifeline Nehemiah Projects. Leonard oversees the finances of the organisation. He is responsible for the financial planning and accountability of the Lifeline Nehemiah Project, including the social enterprises. Leonard also teaches enterprise and employment at the Lifeline Nehemiah technical vocational institute. Separated from his parents and abducted by the rebels Leonard was forced into slavery under the rebels. He lived for three years as a slave until eventually he escaped into Liberia. He then lived for two years as a street child, until Richard Cole encountered him, offering a home and an education. Leonard has taught in the Lifeline Nehemiah Junior Secondary School, and previously served as the transport business co-ordinator in Kono.